This vibrant restaurant was surprisingly busy for a Tuesday evening, particularly as it is squirrelled away in the labyrinth of the Quartermile complex. However, I can see why as the food was good stuff. We hadn’t pre-booked but we managed to secure a table. There was plenty of choice on the menu, including traditional dishes, some non-Malaysian staples and some Malaysian street food. All appetites should be covered with this selection. I opted for the chicken satay skewers for my starter, followed by shredded chilli beef and a side of boiled rice for my main. My dining companion went for curry puffs followed by Malaysian fried rice and chicken. The starters arrived quite quickly, which was good as we had both just been to give blood and needed topping up quite quickly! We had a hot plate set up between us and our plates had been warming on that until the food arrived. The starters then were placed on the hotplate and our plates moved to in front of us. I had three long skewers in my starter, which I thought was a generous portion. 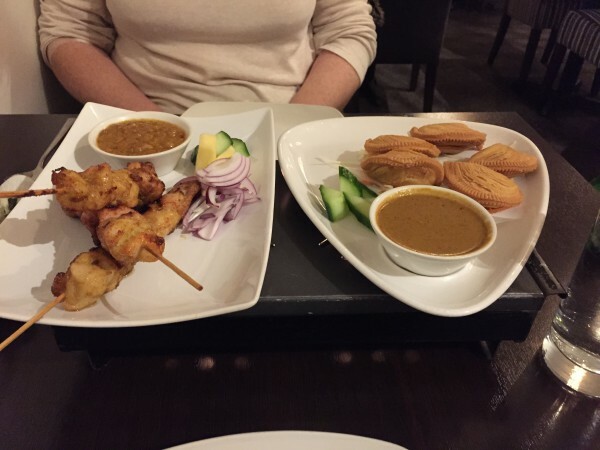 There was also a side salad and a dish of the satay sauce. The satay itself was crunchy in texture and you could easily see bits of peanut in it. This helped the taste pack a punch. However, it did make it a bit difficult to dip the skewers in but that can be forgiven. The chicken itself was incredibly moist. The red onion in the salad also had exceptional flavour. It’s not often that I feel the need to comment on something within a side salad. On the other side of the table, the curry puffs were being enjoyed but they weren’t quite what was expected, which was probably something nearer the puff pastry we might expect in canapés. However, she said there was nice flavour but the accompanying sauce was very hot and might not be suited to everyone. The mains arrived very quickly after the starters, which was a bit of a shame as it meant I struggled to finish all of this course. 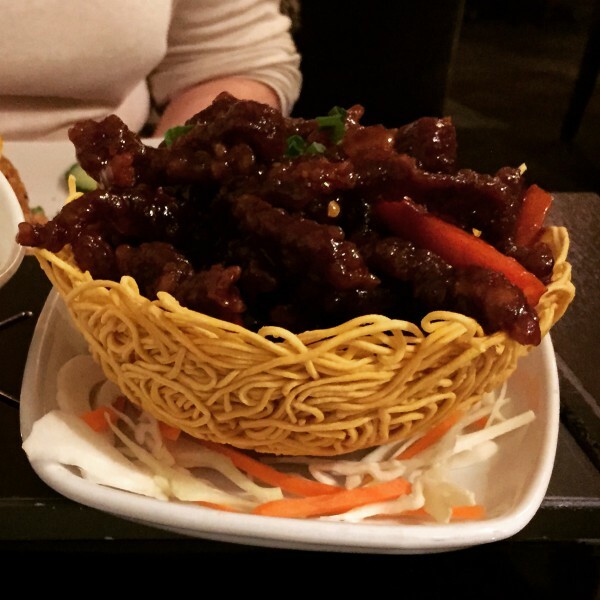 The shredded beef came in a bowl created from dried noodles. The portion of rice was really big enough for two with moderate appetites, so was good value for money if shared. The chilli beef also incorporated carrots, chillies and spring onions, which were sprinkled throughout the dish. The beef was not too chewy, which can often be a problem with this recipe. The stickiness of the chilli coating was a pure treat. It had strong flavour and left a pleasant tingle in my mouth. It’s a bit of a shame the noodles were decorative and seemed a bit of a waste. My dining partner absolutely loved the Malaysian rice and could have eaten a bowlful of that on its own. The chicken was good but the rice was clearly the star of the dish. It’s a shame we were too full to sample the desserts but we’ll have to come back when we had emptier stomachs. We were looked after well and were topped up with water throughout the meal but it was a bit busy so took a little while to get someone’s attention for the bill. 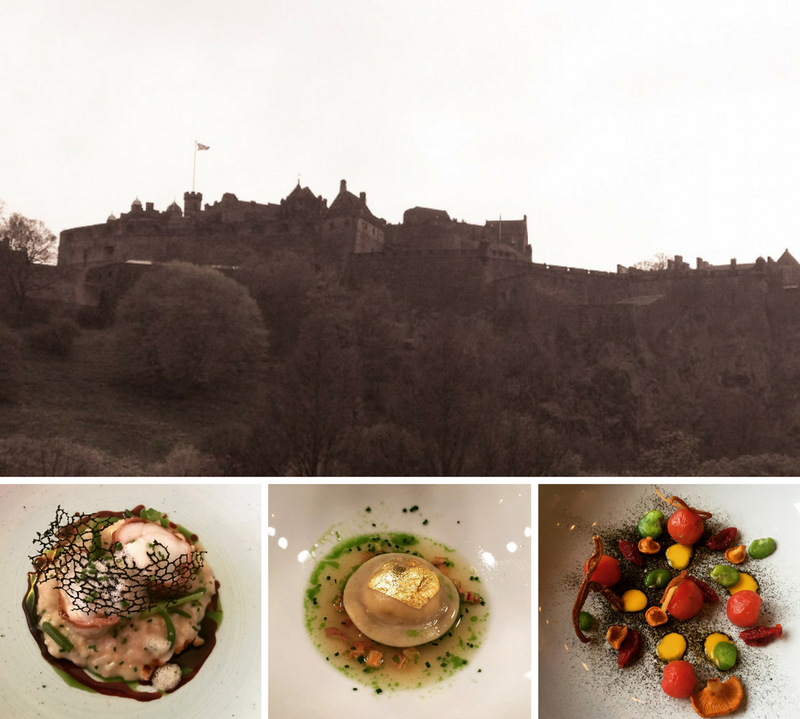 I think this place is punching above its weight and is worth a look in. Cost £36 for two starters and mains with a side of rice.